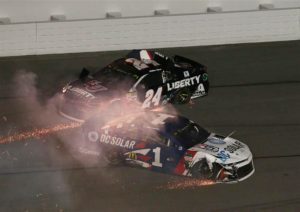 (NASCAR)—Both of Missouri’s drivers left Saturday night’s 400-mile race at Daytona early, their cars used up in major crashes. 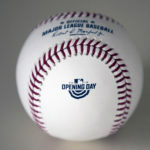 Jamie McMurray was thirtieth in the final standings after a 26-car (out of 40 cars in the race) melee on the third turn of the 55th lap. McMurray, (in car #1) who had started 27th, had raced his way to eighth when three cars ahead of him tangled. He threaded his way between one of the wrecking competitors and the wall, dove low to avoid another of the crashing cars but ran out of room and turned by Kurt Busch. McMurray hit William Byron’s car and became a sandwich between two cars before coming to a stop. He managed to nurse his car around for thirteen more laps before calling it a night. 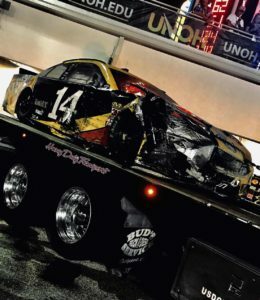 Clint Bowyer’s car was damaged in that crash but continued until a nine-car crash on the 163rd lap resulted in his car being taken from the track on the back of a truck. The race had to go through two overtime periods because of crashes before rookie Erik Jones won his first cup race, edging Martin Truex Jr., across the line. Only twenty cars finished the race and only thirteen were on the lead lap. NASCAR races at a normal track next weekend: Kentucky. 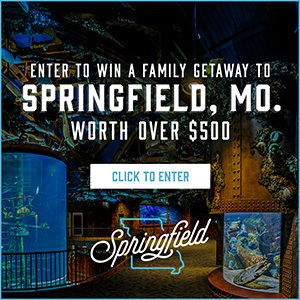 (INDYCAR)—The IndyCar race at Iowa Speedway went to James Hinchcliffe, who had a commanding lead with seven laps to go when the caution flag came out to bunch up the field. Josef Newgarden, who led 229 of the 300 laps and was running second to Hinchcliffe, ducked into the pits for new tires, hoping he could chase down Hinchcliffe when the race resumed. But he never had that chance because IndyCar ended the race under yellow. The victory is Hinchcliffe’s first of the year and the first for Schmidt Peterson Motorsports. Spencer Pigot finished second, his best career finish in IndyCar. Last year’s Indianapolis 500 winner, Takuma Sato, came home third. Newgarden wound up fourth.Points leader Scott Dixon struggled home 12th but retains a 33-point lead on Newgarden. Newgarden’s home town of Toronto is the scene of the next IndyCar race, next Sunday. (FORMULA 1)—Ferari’s Sebastian Vettel extended his F1 points lead by finishing ahead of an oncoming Lewis Hamilton in the British Grand Prix. Hamilton finished 2.3 seconds back after having dropped to the rear of the field after a first-lap shunt with Vettel’s teammate, Kimi Raikkonen. Raikkonen finished third, having gotten past Hamilton’s Mercedes teammate Valtteri Bottas, who was running on worn tires. F1 takes the week off before races in Germany and Hungary ahead of the traditional summer break.